110 Creations: Pink! Blue! Pink! Blue! I'm not sure I'm great with combining colors. I'm trying to get better. 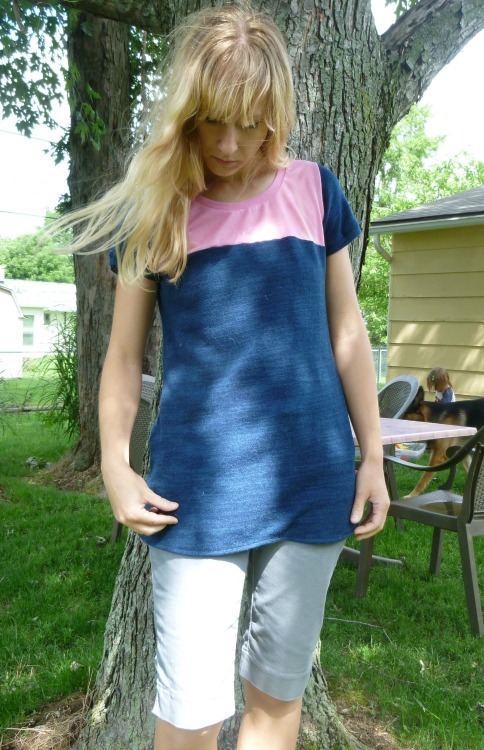 My lack of confidence in this area meant that I'd never made a color-blocked garment before. Until now! To make it easier on myself, I went with a pattern meant for color-blocking, instead of trying to figure out the best way to divide a pattern I already had. This is Vogue 8950, in the smallest size (6). 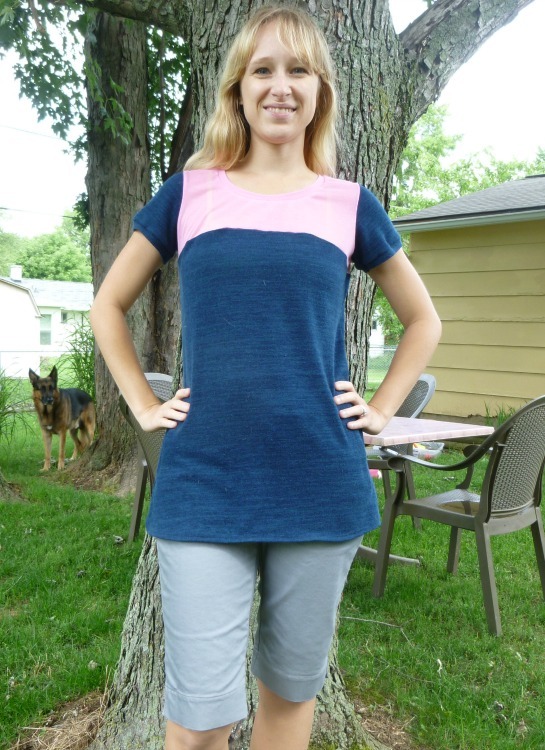 Pretty basic, I know, but I liked the tunic length and the options for different sleeve lengths. I decided to pair two of my Wardrobe Architect colors, navy and baby pink. I'm kind of surprised by how well these two go together, but I really like them! 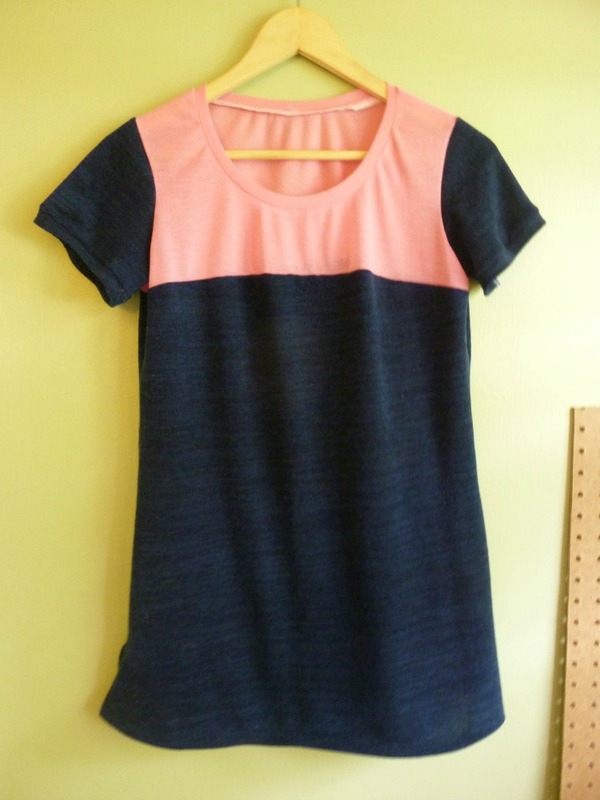 Maybe I can be a little more adventurous in color-blocking in the future? 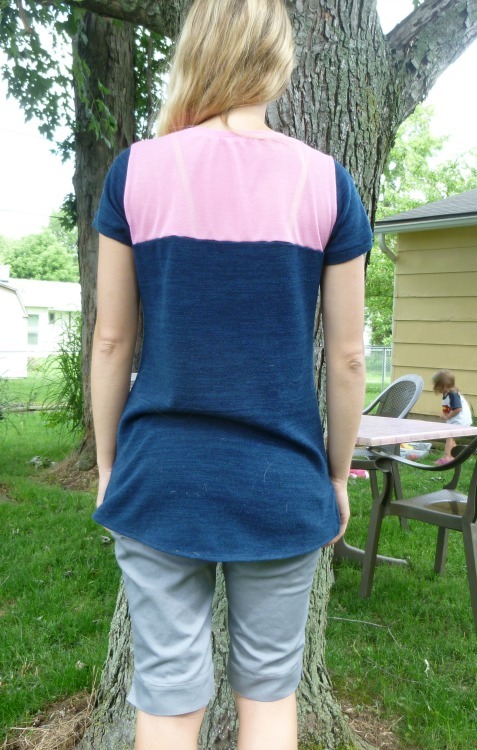 I don't know where I got this crazy idea, but the navy is a sweater knit and I sewed this up in June. Wha...? It hung in the closet for a month before I got a chance to wear it, on a particularly cool day (we've been having a lot of those this summer, after a brutally cold winter). It's a poly-spandex blend from the remnants at Jo-Ann's. 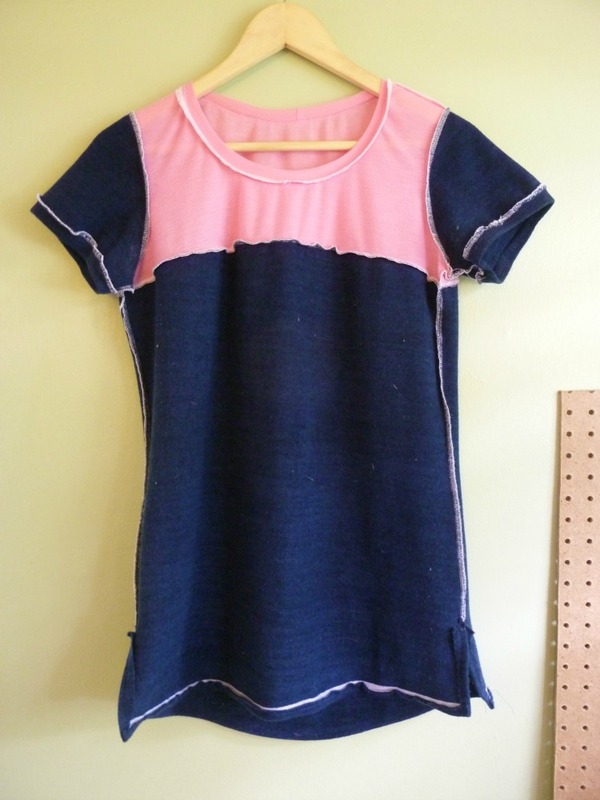 The pink is a sheer tissue knit from Mood. It's polyester as well, which was purposeful. If I'm mixing fabrics, I'd rather they were the same fiber so care is easy to remember (who am I kidding, I wash everything in cold and tumble dry low). I normally don't work with sheer knits, but I thought I could get away with it if it were only a yoke. It does work...but duh you can still see my bra straps. And ain't nobody got the patience to deal with a strapless bra under a t-shirt. I wish I would have underlined it/used two layers. Ah well. Now about the pattern itself. 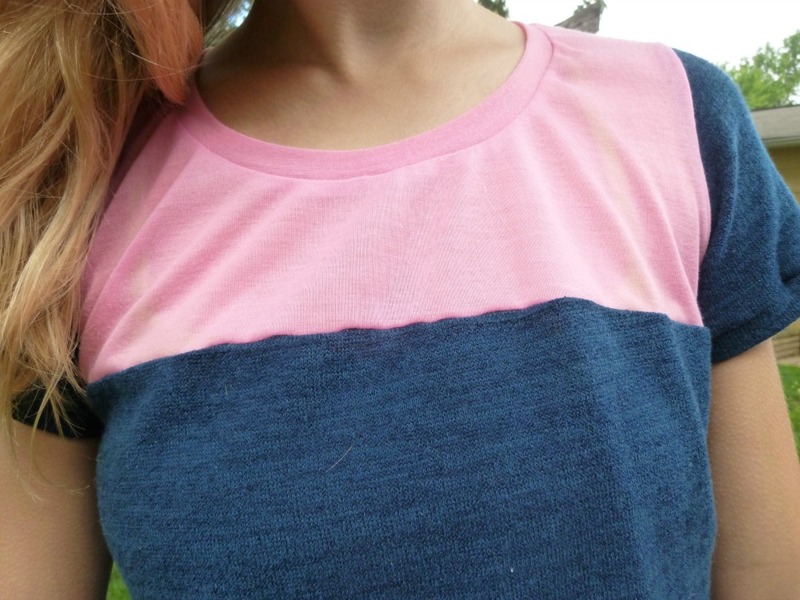 It called for a narrow hem on the neckline (ick) so I sewed a band on instead. I did not remove any seam allowance before doing that, so the neckline is higher than it would be if you followed the directions (I like it my way). Normally I would also need some sort of narrow shoulder adjustment, but the band kind of sucked in the neckline and kept it nice and flat, no gaping! 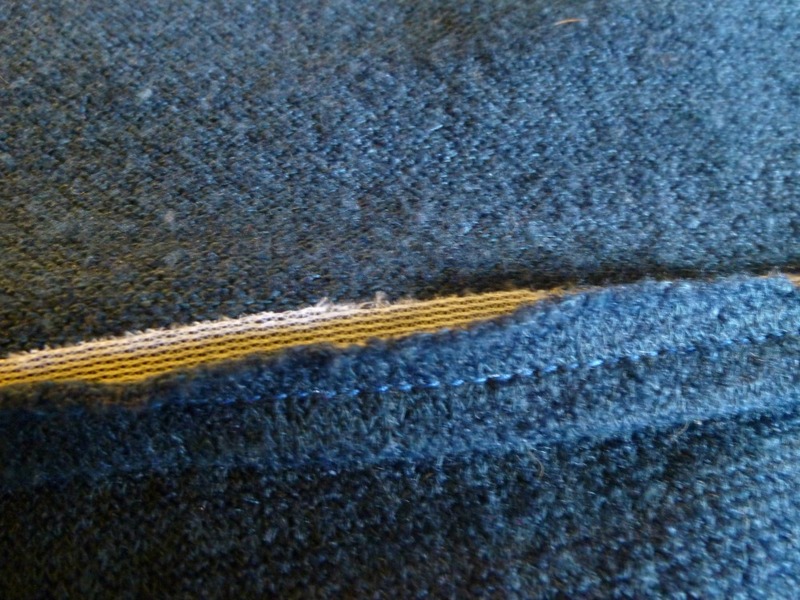 I considered topstitching the seam allowances down, but as you can see the seam was already a tad wavy. Since these are both polyester, no amount of heat and steam fixed the issue. I don't think it's too noticeable IRL, although looking at this photo is making me crazy. The instructions tell you to set in the sleeve. In a knit. Double ick. I suspected that the sleeve cap might be unnecessarily high and require a ton of easing, and I was right (I measured). I folded out about 3/4" of the pattern before sewing, and then had to remove even more height out of the sleeve cap as I sewed it in (flat). Poor drafting by Vogue and perhaps a big enough reason to prevent me from ever sewing this pattern again. Because I decreased the length of the sleeve so much, I added a hem band instead of a regular hem. By that point I was tired of working with the sweater knit so was happy to take the easy way out. I think you need length in the sleeve, otherwise the proportions are all weird with the tunic length in the bodice. The hem had me stumped for a few days. My tests with the sewing machine and a straight stitch were not satisfactory (I did all the other sewing with my serger). I also had to deal with side seam splits. 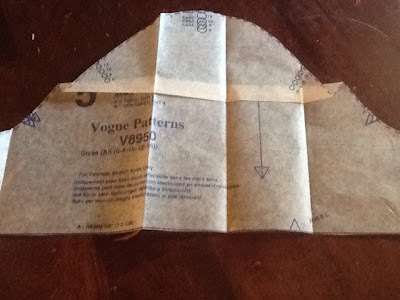 In the end, I interfaced the bottom with 1" strips of knit fusible interfacing. Then I turned it up and sewed the hem like normal, squaring up around the slit. The interfacing miraculously fused to the polyester without issue. The hem was nice and crisp and easy to sew, but not stiff because I used knit interfacing (from Jo-Ann's...I love this stuff!). My only regret is that I didn't finish the insides as nicely as I could have. I honestly thought this pattern would be a complete bust and didn't try that hard. Turns out, I LOVE this tunic and I know I'll be wearing it a lot this fall. I should probably go back and coverstitch the hem to hide the interfacing that's peeking out, but my navy cone thread doesn't exactly match (says the woman who used white serger thread on the inside). Ah well, I'm the only one who sees it so I guess it's not a big deal. Because I was having such trouble photographing the colors, I went inside and tried and ended up with this crazy outtake. This is my life: she's always moving. What do you think, was my first time colorblocking a success? Have you tried it, or are you nervous like I was? Free shipping on A Sewist's Notebook! Use code LJSD14 for free mail shipping, or half off ground shipping. Offer ends August 6th. I was admiring how well the shoulders and sleeves fit you, and wondering if the pattern fit that well straight out of the envelope...but sadly that was apparently not the case :( I too hate it when they make knit patterns overly complicated, like with the set-in sleeves, or a million darts like Burda often does. I love the blue and the pink brightens up the outfit :) You should definitely keep up with the color blocking! Looking at the pattern piece for the back yoke, I thought there would be NO WAY it would fit me. I basically tightened the neckline as much as possible when I applied the band. Sort of accidentally! But it worked out. Sleeping Beauty! I like the pattern, and it looks good on you.